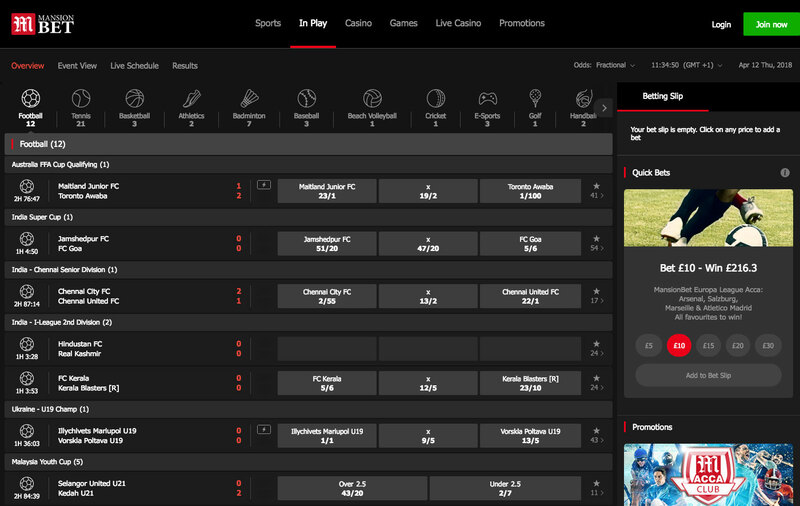 MansionBet is an amazing new online sports book that opened up in January 2018 to provide sports betting opportunities to wagering fans across the UK and beyond. 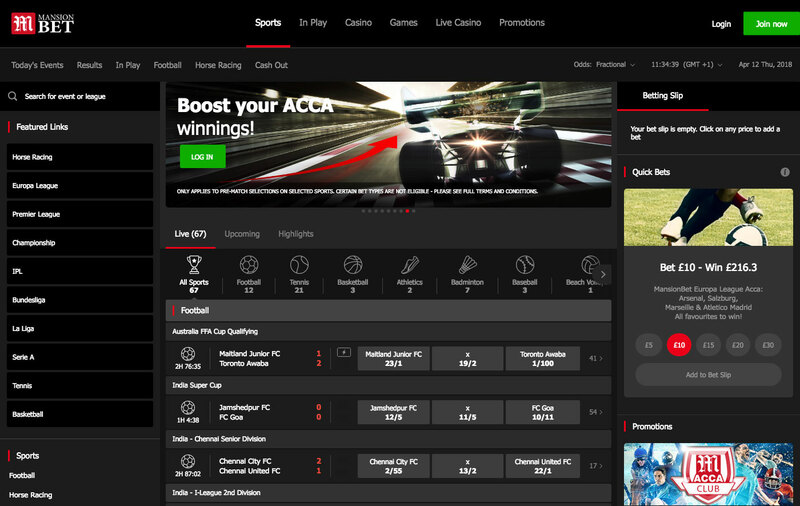 MansionBet is an amazing new online sports book that opened up in January 2018 to provide sports betting opportunities to wagering fans across the UK and beyond. It's the latest venture of Mansion (Gibraltar) Limited, a company that opened MansionCasino in 2004 and added MansionPoker a few years later. Mansion is already a well-known name in UK sport, having sponsored leading English Premier League sides Tottenham Hotspur, Crystal Palace and AFC Bournemouth. This site runs from Gibraltar and via licences granted in the UK by the United Kingdom Gambling Commission. There are two great offers you can take advantage of if sports accumulators (or 'accas' for short) are right up your street. For one, if you place a four-fold acca on football matches, and at least two of your selections are on games in the UEFA Champions League or the UEFA Europa League, then you automatically qualify for a special promotion. If your bet loses, then you'll receive an automatic free bet that will match the value of your qualifying bet up to a maximum of £5. You can use your free bet on any event, as long as you use it within seven days. Your free bet stake is not returned if you are successful, but your winnings are yours to keep. You can also boost your other accas at MansionBet, as long as they have a minimum of five selections. This only applies to pre-event selections on football, horse racing, cricket, tennis, darts, rugby (both codes), snooker and the leading US sports of basketball, ice hockey, baseball and American football. There's a sliding scale of winner boosts from ten percent for five selections, right up to sixty percent for fifteen or more selections, up to a maximum of £10,000. Note that minimum odds per selection in your acca must be 1/5 (1.20) and the minimum total odds must be at least 3/1 (4.00). You can also join the 'Acca Club' at MansionBet – place at least one acca of a minimum five selections during the week (minimum stake £20, minimum single odds 1/5 (1/20), minimum overall odds 3/1 (4.00)) and you'll receive a £10 free 'acca' bet token at the end of the week! In short, if you like sporting bet accumulators, then you'll absolutely love MansionBet. Live betting is available and cash-out options too. Take one look at the MansionBet site and you may instantly be transported back to the days when ALL online casino sites looked like this – white text on a grey and black background. It is not surprising that MansionBet have gone for such a colour scheme, given their online casino and poker background. 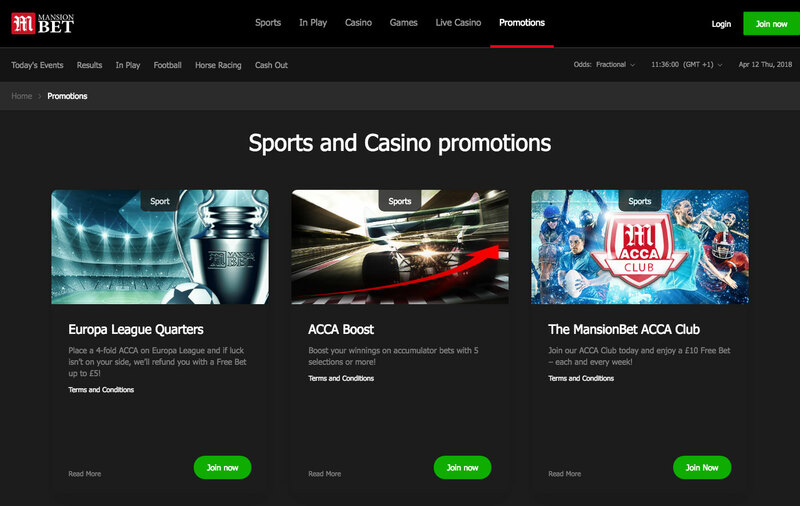 The site is hardly revolutionary – menus on the left, events in the middle and your betting slip, quick selections and promotions on the right – but then does it need to be? It looks good and works well – what else is required? The site accepts Visa and MasterCard credit and debit cards and nothing else, which is a shame. Some sites are turning away from eWallets such as Skrill and Neteller, and even though such methods are convenient it's a lot easier for anyone to open a Skrill or Neteller account than it is to obtain a valid credit or debit card, so legitimising someone's identify is much less of an issue. The minimum accepted deposit is £10, and the maximum is £25,000. All deposits are processed instantly, while withdrawals should take between three and five days. You cannot cash out more than £100,000 in a single day. There is really only one thing we don't like about MansionBet and that's the 'credit/debit cards only' rule but we do have some sympathy with sites that enforce this. Hackers are becoming more sophisticated on a daily basis, so having a valid debit/credit card is one way of virtually assuring someone's authenticity. We'd like to see a welcome bonus too, but the acca deals more than make up for this oversight. If you're successful with your accas here you may just end up with enough cash to buy your own mansion, especially with the acca boost you receive from the MansionBet sports book!